Kenny Jackett has urged Craig MacGillivray to build on his fine start to life at Pompey. The 25-year-old has impressed for the Blues following his summer arrival from Shrewsbury Town. MacGillivray has firmly established himself as Jackett’s No1 stopper, dislodging Luke McGee between the posts. The Scottish talent has featured 18 times in all competitions and registered seven clean sheets. Before moving to Fratton Park, MacGillivray found himself down the pecking order at former clubs Walsall and the Shrews. The Blues boss said: ‘Craig’s taken a lot of things in his stride so far. ‘When he came to us he hadn't played many league games. 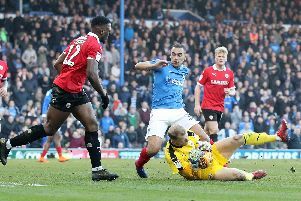 ‘Craig very much played second fiddle to Dean Henderson last season in an outstanding Shrewsbury Town team. ‘I'd seen Craig at Walsall when I was at Wolves. He was a little bit unlucky not to play at Wallsall. ‘Neil Etheridge was with them at the time, who is at Cardiff City now, and then he got stuck behind Henderson. ‘Craig has perhaps been a little unlucky, slightly frustrated. ‘He got to his mid-20s, got to 25, and hadn't played as many league games as he would have wanted or had as many chances or opportunities as he would have liked. ‘I think for us at Portsmouth, we have benefited from that. ‘So far he has taken everything in his his stride and maintained the same attitude, which is a determined, but a very level one. ‘There is no reason why he can't continue to build on what has been a good first half of the season so far. ‘If you are being successful that is good. Some members of the Fratton faithful believe MacGillivray’s form warrants a maiden Scotland call-up. Sunderland keeper Jon McLaughlin is a regular in Alex McLeish’s set-up, although he misses their upcoming Nations League game against Albania on Saturday. Jackett has insisted there’s been no approach from Scotland regarding MacGillivray, however. 'Nobody from Scotland have contacted us,’ the Pompey manager added.